Continuous Delivery allows for faster and more reliable deployment of software in production. The foundation is a Continuous Delivery pipeline that automates the deployment process. This enables a reproducible, low-risk process to bring new releases into production. The book is a 100% practical guide to building Continuous Delivery pipelines that automate rollouts, improve reproducibility, and dramatically reduce risk. It introduces a proven Continuous Delivery technology stack, including Docker, Chef, Vagrant, Jenkins, Graphite, the ELK stack, JBehave, and Gatling. The book guides you through applying these technologies throughout build, continuous integration, load testing, acceptance testing, and monitoring. Wolff’s start-to-finish example projects offer the basis for your own experimentation, pilot programs, and full-fledged deployments. 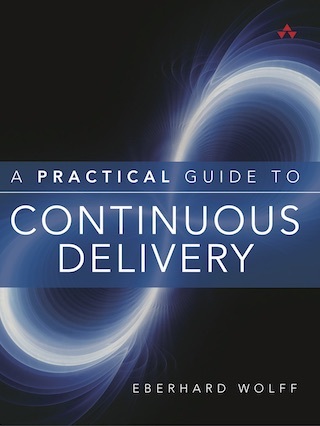 Understand the problems that Continuous Delivery solves, and how it solves them. Eberhard Wolff , a Fellow at innoQ in Germany, has more than 15 years of experience as an architect and consultant working at the intersection of business and technology. He gives talks and keynotes at international conferences, has served on multiple conference program committees, and has written more than 100 articles and books. His technological focus is on modern architectures—often involving cloud, Continuous Delivery, DevOps, microservices, and NoSQL. He is author of Microservices: Flexible Software Architecture. Bastian Spanneberg has written chapter 3. He is a Senior Engineer at Instana where he works on platform architecture and automation. His Twitter handle is @spanneberg. You can find the example project on Github: https://github.com/ewolff/user-registration-V2 .